FBO | What Does FBO Mean? 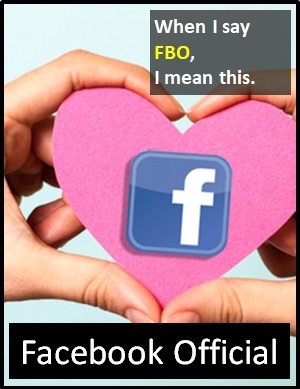 FBO means "Facebook Official". When two people are in a relationship, declaring the status of the relationship publicly on social media is considered an important step in making the relationship official. Many people may question the legitimacy of a relationship if it has not been published on Facebook. FBO is not just for positive statuses. In the eyes of many people, break-ups must also adhere to the same rule. According to some, a relationship is only real when it's "Facebook Official". Person A: Did you see Kyle and Jenna are FBO? Person B: It must be getting serious! Person A: I can't make it tonight. I have plans with Kayla. Person B: Seriously, when are you guys gonna make it FBO? As it is pronounced using its individual letters (i.e., "Eff Bee Oh"), FBO is classified as an initialism abbreviation. Initialisms are different to acronyms, which are spoken like words. Before the digital era, we might have said something like "Courting" or "Dating" instead of FBO.